I have been busy lately preparing for something that you will find out about soon! lol I love to tease!! This card on my desk for 2 weeks and I have finally finished it. 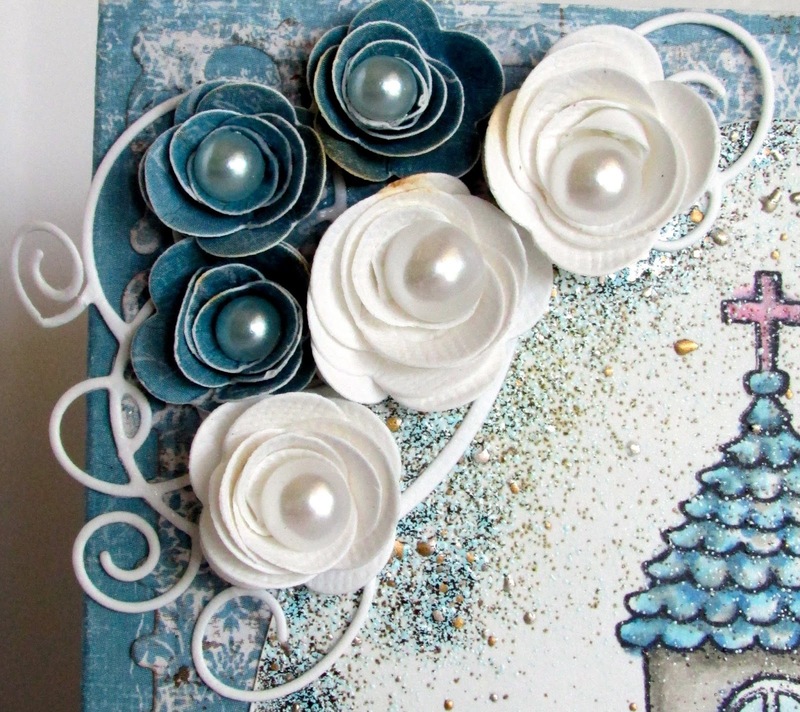 Don't you love the lush Maja Papers in blue for this card? 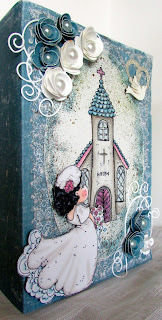 I cut the papers with Spellbinders Enchanted Labels 28 die to make the design on the front. Tilda is mounted with dimensionals for a 3D effect. Stampendous Aged Aqua Frantage is sprinkled all around the oval and heated from the backside. I love the effects. I made my own rolled flowers and while they were drying, my son and the dog were playing and knocked them off the table so now they are a bit wonky. I put pearls inside and glued them over the Memory Box die elegant scrollwork. I cut 2 rings from my glitter paper with 2 circle punches and painted the wooden bird white. A side view to see the dimension better. I hope you enjoyed my card today, have a wonderful weekend ahead. I plan on catching up with all my blogging friends this weekend, missing you! This is absolutely gorgeous, Kelly. Love your attention to detail. Beautiful artwork. Kelly this is absolutely gorgeous and I am loving those rolled flowers. Awesome colouring as well. Wow! This is gorgeous! 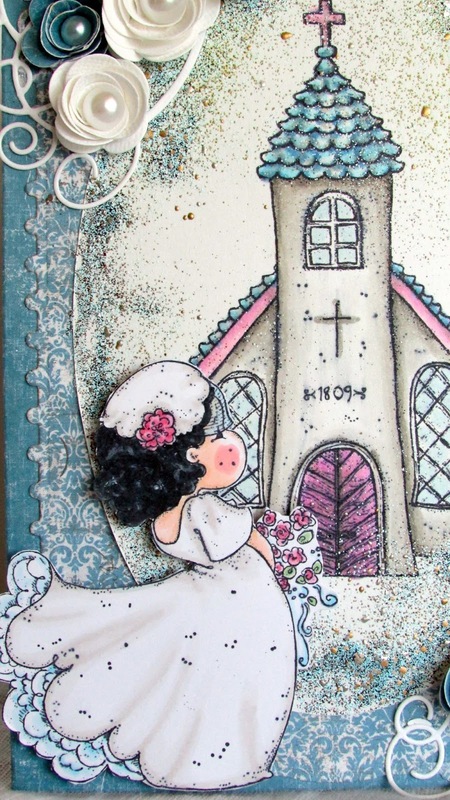 Your wedding cards are always beautiful!! 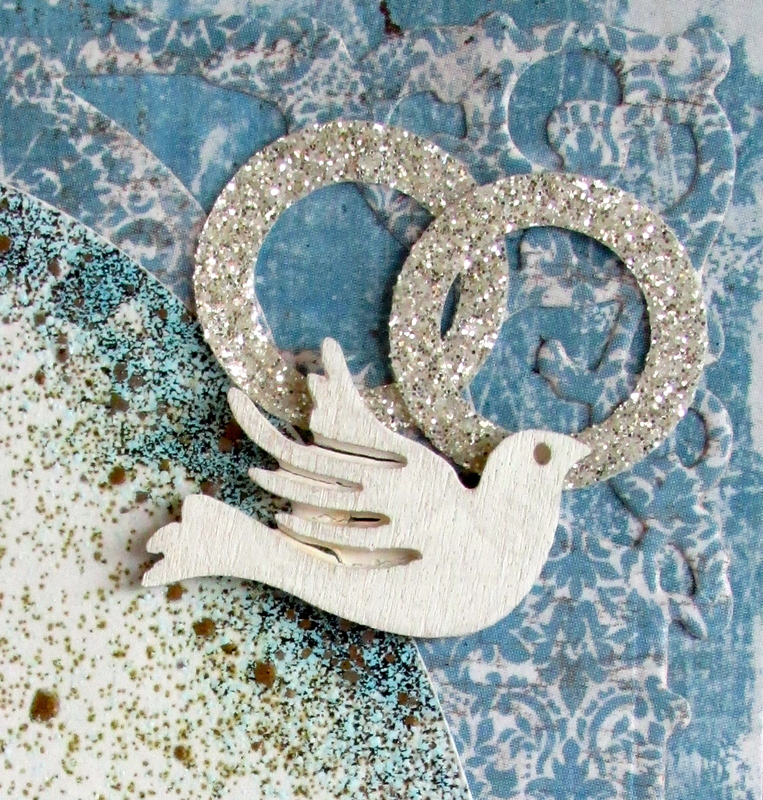 Love the dove with the double wedding rings! Really pretty. Love the way you colored the background. Oh so pretty, Kelly! The flowers and swirls are gorgeous! Love it! Gorgeous card Kelly! Love all the pretty details! Thanks for joining us @ Tilda's Town this week! Have a wonderful weekend! Wow!! 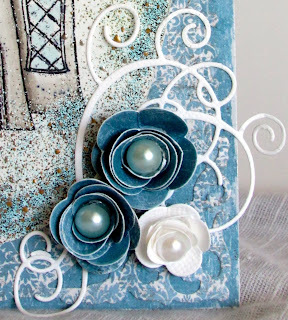 this is so gorgeous Kelly wonderful design, love your frantage, rollled roses and of course that so sweet Tilda. A real beauty my dear. Wowwww Kelly!!! This is incredibly GORGEOUS! Your details are sooooo STUNNING and I love how this feels so whimsical .. it's so PERFECT!!! Love it! Very pretty Kelly! such a precious scene. I love all the details, absolutely stunning.the flowers are awesome. Well everything is just so beautiful Kelly! Hugs. WOW....this is phenomenal, Kelly! I love how the gown comes off the card....outstanding design and coloring. 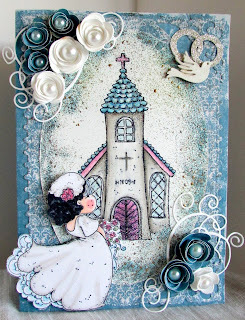 Love the church and pairing it with Wedding Tilda is brilliant! Kelly this is totally beautiful! Wow lots to admire here. Great colors and those flowers are great! You sure one busy lady!! Very beautiful Kelly and I agree about the papers, they're dry pretty! Love your colouring and the roses look superb, I would never have known :-)! Hope you had a good week, looking forward to hearing your secret LOl! Hugs, Chris. Your card is absolutely gorgeous! I love your rolled flowers. Beautiful Kelly! Gorgeous Wedding scene! love it! So glad you linked up to Tilda's Town Challenges! Thanks for playing! Fabulous Kelly! I love this little scene and that Magnolia is one of my faves. I like the blue and those little rolled roses. So pretty and romantic, Kelly - gorgeous, sparkly and such fabulous flowers! Lovely! Great background. Anyone would be thrilled to receive this. Wow kelly sure do miss all these spectacular creations!!!!! What a gorgeous scene you made!!!!! Such a keepsake for sure!!!!!! Have a great day my friend!!!!! So very pretty! The recipient will treasure this forever! Beautiful card, Kelly. Wonderful scene you've created. Love this Tilda image--yet I still haven't coloured mine...LOL. Your rolled flowers are gorgeous. I sure am glad you finished this card because it is so beautiful! Love those flowers! !